Northwest Florida beaches are some of the best in Florida, and some of the most beautiful in the world. Many years ago I was a naval aviation cadet flying out of Pensacola. The Northwest Florida beaches I flew over back then were the most undeveloped and pristine beaches in the United States. Florida travel in those days was usually on US-90 or US-98. I-10 was in the distant future. he huge crush of retirees was decades away. It was hard to imagine this stretch of wilderness ever being anything different. That was then. There has been much development, but plenty of remote Northwest Florida beaches still remain to be explored. Northwest Florida still has the longest whitest stretch of beautiful soft sand beaches in the state. Although some of the beaches get fairly crowded, especially in the season (summer), they are generally not as crowded as those in the rest of the state. One exception is Panama City Beach. It has been discovered by college students and is the location of "Spring Break". This is one of Northwest Florida's major vacation destinations, and its beaches are a large part of the reason why. Northwest Florida citizens are trying to avoid the mistakes that have turned much of the rest of Florida into beachfront canyons. 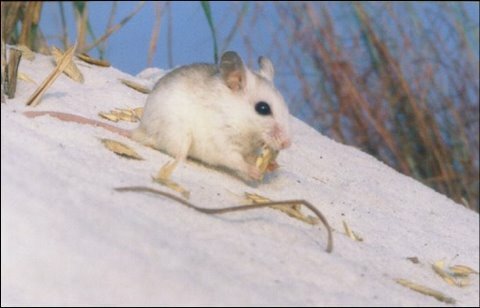 Preservation efforts are very strong, including limiting development to preserve the habitat of the endangered Perdido Key Beach Mouse. Mickey Mouse is not the only honored Florida rodent. Pensacola Beach. The entire stretch of Santa Rosa Island has beautiful white sand beaches. Pensacola Beach has a wonderful 8 mile long beach, and also has plenty of restaurants, shops and bars with entertainment. Gulf Islands National Seashore. This is a 150 mile stretch of protected shoreline in Florida and Mississippi. The Florida portion of the seashore features offshore islands with sparkling white sand beaches, historic fortifications, and nature trails. Mainland features near Pensacola, Florida, include the Naval Live Oaks Reservation, beaches, and military forts. All Florida areas are accessible by automobile.It has beautiful white sand beaches and hundreds of species of birds. Perdido Key State Park is a secluded 247-acre barrier island about 15 miles southwest of Pensacola. A great spot for picnics and nature watching. Santa Rosa, Ed Walline Park. There are several public beach-access points in the town of Santa Rosa. Ed Walline Park is a popular one. You access the beach from a boardwalk, down 25 steps to its silky sands. Lifeguards are on duty here during the summer season. Topsail Hill Preserve State Park is one of the most beautiful beaches on Santa Rosa Island. The 1,640 acre park is home to a dramatic landscape, including sand dunes topping 14 feet and old-growth long-leaf pine forests bordering a quiet and unspoiled 3.2-mile shoreline. FORT WALTON BEACH AND DESTIN TO PANAMA CITY. Homes here are generally more beachey and cottage style as opposed to the opulent mansions seen elsewhere on the ocean in Florida. Seaside is the crown jewel in this area of Northwest Florida. It is a new urban village of Florida Cracker designed homes. It quaint and ancient, although it's not yet 30 years old. 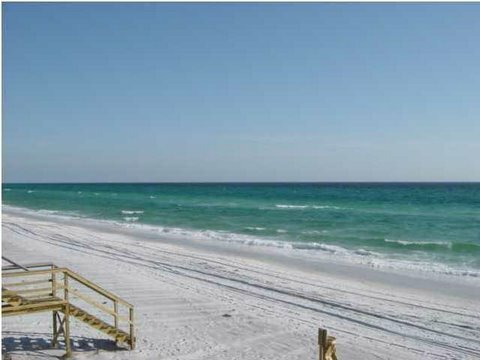 It has one of the best Northwest Florida beaches, as do the neighboring villages of Grayton Beach and Seagrove Beach. has one of the most beautiful beaches as well, and in addition to conventional campsites they have some reasonably priced camping cabins. This is an extremely fast growing area. In many ways it reminds me of Miami 30 years ago. Dozens of new developments, high rise condominiums, a major airport expansion and a lot of business activity show that this an up and coming area. Panama City Beach has beautiful beaches and there are thousands of beachfront vacation accommodations. It also has a lot of clear water and is great for diving. On the downside, it gets loud and rowdy during annual Spring Break! Mexico Beach. A small southern town on the Gulf of Mexico. Lots of good fishing in the surf, and quiet swimming beaches. Lots of shops and seafood restaurants. A feeling of Florida Cracker community among the Northwest Florida beaches. St. George Island State Park. Enjoy 9 miles of undeveloped, isolated beach graced by tall sand dunes. Camping sites are available. Great fishing for sea trout, redfish, mackerel and other species. Several good nearby restaurants and watering holes in spite of the isolation.